Black Legion Camping Hatchet | BUDK.com - Knives & Swords At The Lowest Prices! 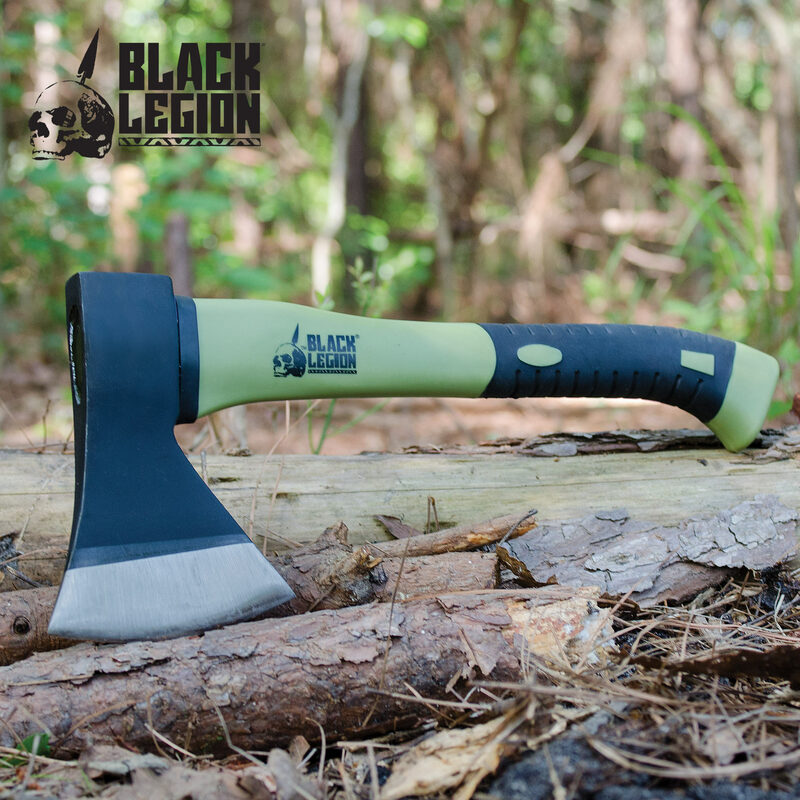 Built for tough use, the Black Legion Camping Hatchet has a 4" extra-thick axe blade with a blunt hammer side. Whether you are splitting wood or drywall, it will get the job done in record time. The handle is made of sturdy fiberglass with a rubberized slip-free grip. Do not go camping without this tool as part of your gear. I got this axe for myself and for Christmas gifts. It's well balanced and sharp. Good quality and a great value. Im giving this a 4 star because it doesn't come with a sheath. Otherwise it holds up better than my expectations were originally! ???????? I got this on sale for 10.00 and free shipping, as a result my expectation weren't that high, When it got here i was blown away at the quality of this Hatchet. It takes a mean one on all others i have great product. I would recommend it to any one looking for a great hatchet that wont break! And wont break the bank. I tried this axe out last month chopping fire wood on a mountain back packing trip. It chops better then my other survival axes and it sharpens back up in 2 minutes with a file. 13 dollars compare to 60 dollars for other survival axes and this one is way better. This is a great buy, get it while you can. This is a excellent piece. I got this for my dad for Christmas and he loves it. He uses it all the time and I would use this in a fight to death against an army of zombies so I fully recommend this for survivalist. Got this and used it chopping some wood outback. Very nice, not super sharp but sharpening it up made it a great all around hatchet. 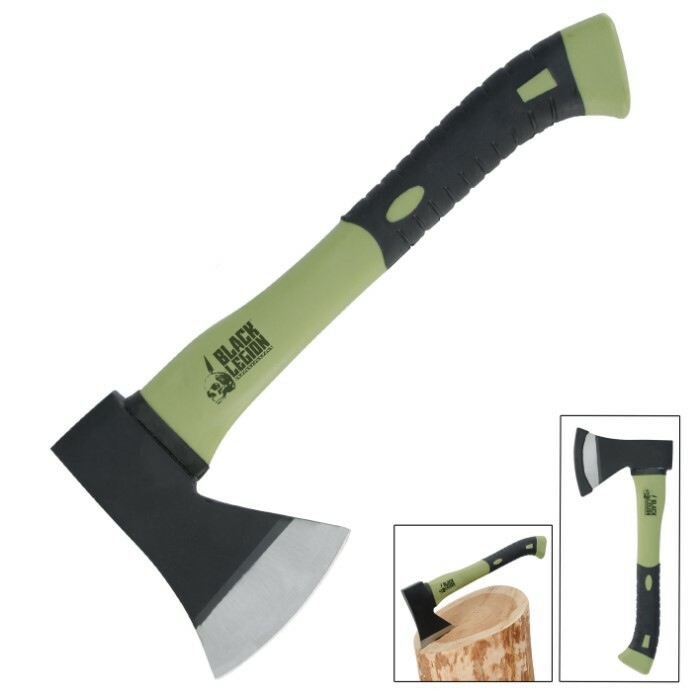 I love this axe for camping and outdoor work. It came with a cover for the blade which is good enough, considering the price which is a bargain. I like to go camping and "survive" off the land. I brought this ax along with me and used only this to split enough firewood for a fire to burn 24/7 for a week. As I said in the header,I must have split a whole tree with this ax and it held up great and is ready for next year's trip. I had my doubts when I saw the ax but it blew my expectations out of the water, for the price especially. I could not ask for a better tool, thanks budk. Look no further, this is a outstanding hatchet!...best bang for your money. Buy one for all your friends and family! I received this as a Christmas gift from my sweetheart, since he sees me periodically take my old broken hatchet to wood when I'm stressed or angry. It's practical and a good weight since I'm not very strong and I'm a very small woman in stature alone. It's exactly what I expected and a little more since I didn't think this blade as is would cut anything, but one swing unsharpened and I split a good sized log and shot splinters across the room. As for the 'glue' It's not actually a practical piece and can be removed if the user desires. Simply the little decorative band around the bottom and has nothing to do with the structural integrity of this item. Over all, it's comfortable, well shaped, a good weight, and I expect to use it on a daily basis to split wood this winter. For all of those people out there who are upset about it being dull bear in mind that I am a clumsy fool and would most likely chop off my own toes if it came fully sharpened so if you're gifting it to another fool it's perfect. Got two of these on a BoGo sale. They look good, but the handle is attached to the blade with what seems to be hot glue, and the metal head separates from the handle after a short amount of use. NOT a tool you want in a bug-out bag or any situation where a modicum of reliability is an issue. That said, you get what you pay for, and if you're expecting a quality item marketed as a "zombie apocalypse" tool - well ... there ya go.